A cluster of organic Concord Grapes (Vitis labrusca) in a British Columbia vineyard. A photograph from the fall of 2009, this was one of my first photographs using my (then) new Canon 70-200mm f/4 IS. 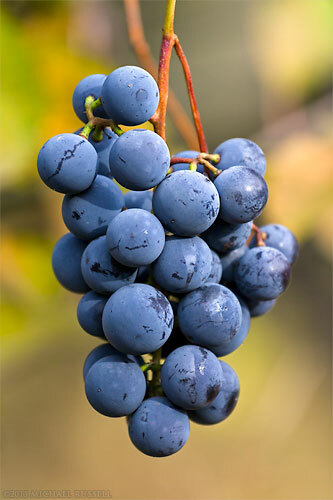 This is a group of Concord Grapes (Vitis labrusca) which are often used for grape jellies, grape juices, and sometimes wines. The Concord Grape was first created in 1849 by Ephraim Wales Bull in Concord, Massachusetts – so you can see where the name came from. You can see more of my photographs of fruit and other garden plants in my Garden Plants Gallery.